So, you've created your profile on LinkedIn, and you've built your network, but how do you optimize your profile? Change the LinkedIn header from the default 'Job title at Company' format to reflect your core skills and interests - position yourself for the next job rather than the one you currently have! And you have 120 characters available to shout out who you are, what you do, what your ideal client is, etc. In the Summary section you have up to 2,000 characters to represent your skill set and achievements. Draft your entry first in MS Word and copy and paste into LinkedIn. That will help to spell check, and you might be able to pull through some bullet point formating also. Use white space, bullet points and CAPITAL letters to draw the reader's eye. Customize the web links to your website, etc. by editing the web address and, instead of choosing the default "Personal Website," "Company Website," "RSS Feed," "Blog" or "Portfolio" select "Other" so that you see an additional field appear. You can then describe your website, blog, etc. with a call to action that makes it more meaningful and attractive. Link your Twitter account to your LinkedIn profile: that way, people can easily jump from your profile to find your most recent micro-thoughts from Twitter. But, set the link up the other way, too, so that your tweets automatically update your LinkedIn profile status. Just remember to keep your tweets professional to enhance your reputation! 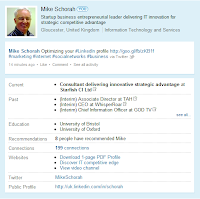 And, an absolute must do: customize your LinkedIn public URL to be of the form http://uk.linkedin.com/in/schorah - Then use that URL on your website, your email signature, Facebook and anywhere else you can think of to send people back to your profile. This one tip is a gold mine because LinkedIn pages get incredibly highly ranked by Google so you should find your LinkedIn profile appearing on the first page of Google hits whenever people search for your name.